Earlier this month we got wind that the 747 Wing House in Malibu was nearing completion, and David Hertz Architects just sent us the first photos of the finished recycled airplane home! 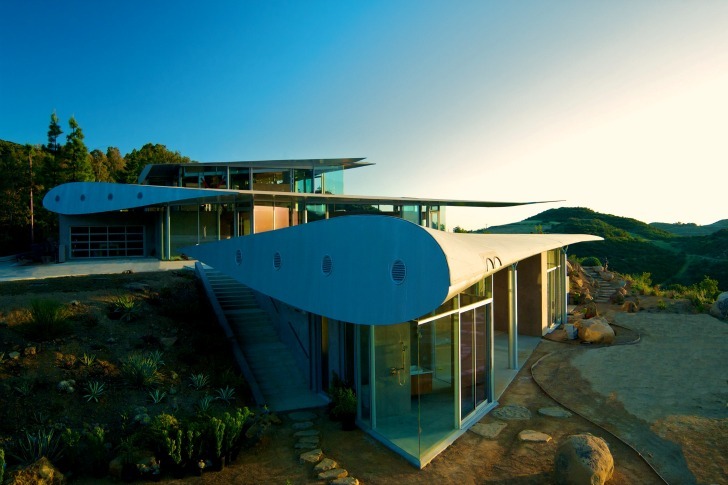 Built from a decommissioned Boeing 747, the floating roof made out of the plane's wings result in a curvilinear home with large floor to ceiling windows to take in the sights of the Malibu mountains and Pacific Ocean below. Over time David Hertz and his team at Studio of Environmental Architects will be making use of the whole 747 plane including the wings, the fuselage, and cockpit to build not only the main house, but also guest quarters, a meditation pavilion, a barn and an art studio. The 747 Wing House, the main residence, was the first to be completed. Inspiration for using the metal behemoth came from the property itself, which was formerly owned by costume designer Tony Duquette, who built more than 20 structures from found objects on the 55-acre property. The new owner commissioned David Hertz to build a home with curvilinear/feminine shapes and while Hertz was exploring roof ideas he came upon the idea to use an old airplane wing. This adaptive reuse concept fits perfectly in line with the previous owner’s found object philosophy and many of the existing site pads and retaining walls are being reused to minimize site impacts. Costing less than $50,000 the reclaimed plane has been dismantled and transported to the site, where almost all of the parts have been reused as a way of being economical. Prefabricated parts were also utilized to minimize onsite construction costs. Totally sustainable. I think if more Americans lived in 55 acre properties there would be less homeless people, less crime, more endangered species, all good things. Where is the banner that reads 'mission accomplished'? Words matter. The four "R"s (Reduce, Reuse, Recycle and Re-purpose) are a great, simple guide to going green. But often these words are used inappropriately, and we miss chances to education the public. For example, in this article: http://inhabitat.com/photo-update-completed-747-house-made-of-an-old-plane-soars-to-new-heights/ The plane wings are claimed to be "recycled", but actually they are "Re-purposed" as a roof. A Recycled wing would either be used a wing on another plane, or melted into new aluminum. Not a small issue- if everytime we look at "trash" and see all of the Four R's, much of that trash would become treasure. Over time David Hertz and his team at Studio of Environmental Architects will be making use of the whole 747 plane. They will use the wings, the fuselage, and cockpit to build not only the main house, but also guest quarters, a meditation pavilion, a barn and an art studio. The 747 Wing House, or the main residence was the first to be completed. Inspiration for using the behemoth came from the property itself, which was formerly owned by costume designer Tony Duquette. Duquette built more than 20 structures from found objects on the 55-acre property, but most were destroyed in a fire. The new owner commissioned David Hertz to build a home with curvilinear/feminine shapes for the building. While Hertz was exploring roof ideas he came upon the idea to use an old airplane wing. This adaptive reuse concept fits perfectly in line with the previous owner's found object philosophy. Many of the existing site pads and retaining walls are being reused to minimize site impacts. Costing less than $50,000 the reclaimed plane has been dismantled and transported to the site, where almost all of the parts have been reused as a way of being economical. Prefabricated parts were also utilized to minimize onsite construction costs. Besides the extensive use of reclaimed materials, the Wing House also makes use of solar power, radiant heating, natural ventilation as well as high performance heat mirror glazing. The Main Residence will use both of the main wings as well as the 2 stabilizers from the tail section as a roof for the Master Bedroom. The Art Studio Building will use a 50-foot long section of the upper fuselage as a roof. The remaining front portion of the fuselage and upper first class cabin deck will be used as the roof of the Guest House. The lower half of the fuselage, which forms the cargo hold, will form the roof of the Animal Barn. A Meditation Pavilion will be made from the entire front of the airplane at 28 feet in diameter and 45 feet tall; the cockpit windows will form a skylight. 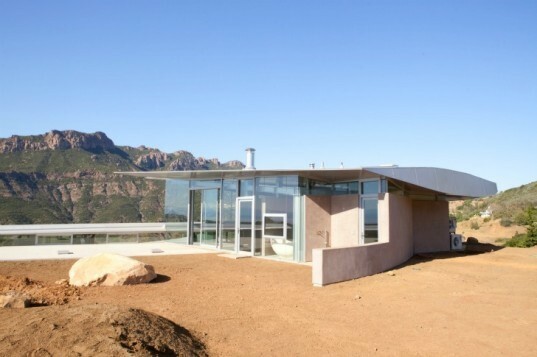 With views of the Malibu mountains, the Pacific Ocean and the islands in the distance, the 747 Wing House is a site to behold. Located on a ridge, evening views of the home at sunset recall the same sort of view that one would see while flying in a plane as the sun goes down.